The Australia II was owned, designed and built by Sydney Engineer Mr. Harley Newman. The advantages of Australia II over the original gyrocopter, named Australia, include a more streamlined overall design, lighter weight and a single rudder to reduce the air drag created by the twin rudders on the original machine. The engine is a turbo charged 900cc BMW motor bike engine. Features of the aircraft include a Streamlined Cabin, Hydraulic Pre-Spin Wind Up for the Rotor Blades, Full Instrumentation, Hydraulic Disc Brakes, Self Starter, Radio Communication, Cabin Controlled Adjustments for Advance and Retarding the engine, altering the Fuel Mixture of the Carburettor and directing the Oil Flow from the Hydraulic Pump to the Hydraulic Motor in the Rotary Head. The Fuel tank has been designed to be an integral part of the Cabin area. Also of note was the design of the Tail Plane and Rudder. Australia II was never flown. However, a considerable amount of Ground Testing and Development on the Engine, particularly the Turbo Charger had been carried out. At the time of Mr. Newman's death this machine was producing high Horsepower and Static Thrust. At the time of it's construction, Australia II was by far the most technically advanced Gyrocopter in Australia. 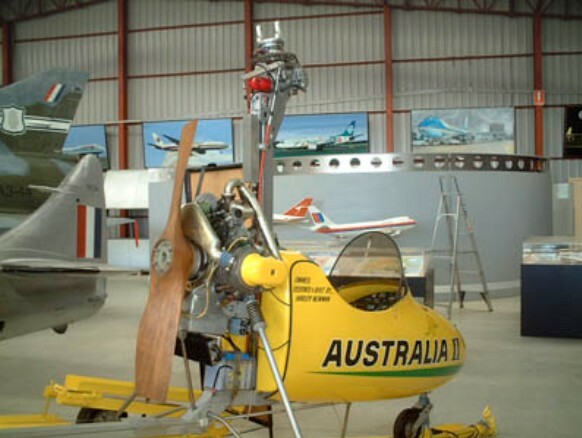 Australia II was donated to the Australian Aviation Museum by Harley Newman's son Gordon, as this was his father's wish.